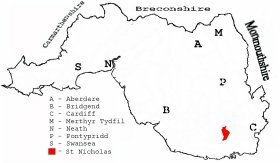 An on-line index to the book St. Nicholas A Historical Survey of a Glamorganshire Parish, by Charles F. Shepherd  has been provided by David Webb. You can also perform a more selective search for churches in the St Nicholas area or see them printed on a map. A transcription of the registers is available from the Glamorgan Family History Society for the years: Baptisms, 1724-1900, Marriages, 1724-1837, Burials, 1724-1902. St Nicholas Ecclesiastical Parish records " ........ including registers of baptisms, 1762-1915; marriages, 1755-1812; banns, 1802-1973; burials, 1762-1966; licences, 1884; records relating to property, 1829-1850; churchwardens, 1876-1878, parochial church council, 1925-1960; vestry, 1800-1960; civil parish, 1792-1955; church affairs, 1890"
Conservation areas within the Vale of Glamorgan. See St Nicholas - "Conservation areas are areas of special architectural or historic interest, the character or appearance of which it is desirable to preserve or enhance"
Transcript of complete name listing for St. Nicholas, with the parishes and villages of St. George's, St. Lythans, Peterstone-super-Ely, and Pendoylan, from Slaters Directory for 1880. The transcription of the section for St Nicholas from The National Gazetteer (1868) provided by Colin Hinson. Ask for a calculation of the distance from St Nicholas to another place. You can see the administrative areas in which St Nicholas has been placed at times in the past. Select one to see a link to a map of that particular area. The Population of St Nicholas was as follows, and a more detailed breakdown is available. St Nicholas Civil Parish records " ........ comprising copy of tithe plan and apportionment, 1838 [copied 1980]; assistant overseer's rate book, 1919-1925; assistant overseer's receipt and payment book, 1907-1927; parish council minutes book, 1894-1950; parish council receipt and payment books, 1920-1970"